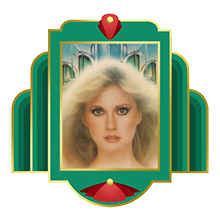 In today’s very special episode, dear listeners, we celebrate our first year of podcasting with an episode all about XANADU! That’s right, friends, it’s all leg-warmers and ribbons and magical Olivia Newton John today! And for this grand event, we called up some fellow Xana-fans and former guests, namely Gordon Smuder (of the Puppet Forge and Transylvania Television) and Sharon Stiteler (aka Birdchick). Further show notes and links behind the cut!